This time he takes out the 3-ton granite monument that had been installed 24 hours earlier on the lawn of the Arkansas state capitol in Little Rock. In the video, the Arkansas capitol dome can be seen lit against the night sky as the Dodge Dart accelerates to 10, then 20 mph. The vehicle speeds up the hill and the last thing that comes into view before a crash is a large, newly installed monument. Authorities say the man in the video is Michael Tate Reed, an alleged serial destroyer of Ten Commandments monuments. He was arrested by state capitol police officers at the scene early Wednesday, according to Michael Powell, a spokesman for the Arkansas secretary of state. Reed is charged with criminal trespass, first-degree criminal mischief and defacing objects of public interest. 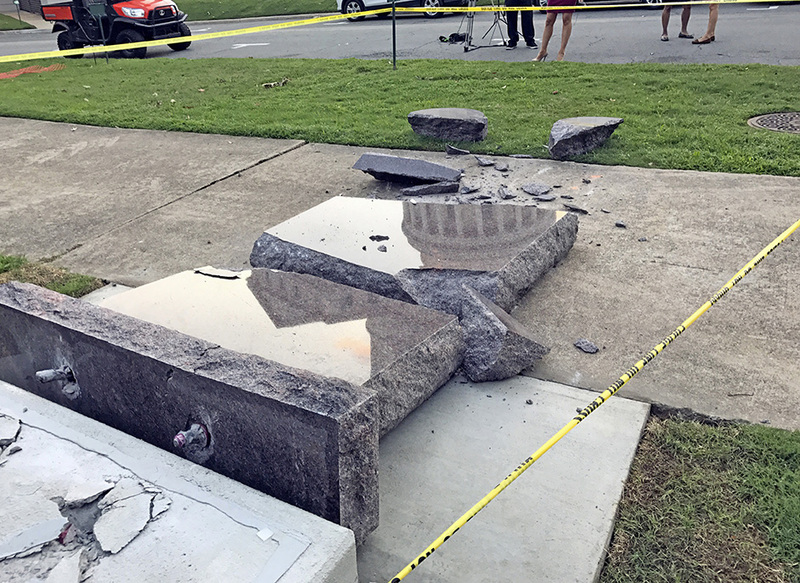 That object of public interest was a three-ton granite monument that had been installed less than 24 hours before its violent, pre-dawn demise on the southwest lawn of the state capitol in Little Rock. Crews had cleaned up the crash site by late Wednesday morning and taken the broken pieces to storage, Powell said, but it was unclear whether the controversial monument would be reinstalled. Reed could not be reached for comment. Powell told The Post he wasn’t sure if Reed had been released from jail. 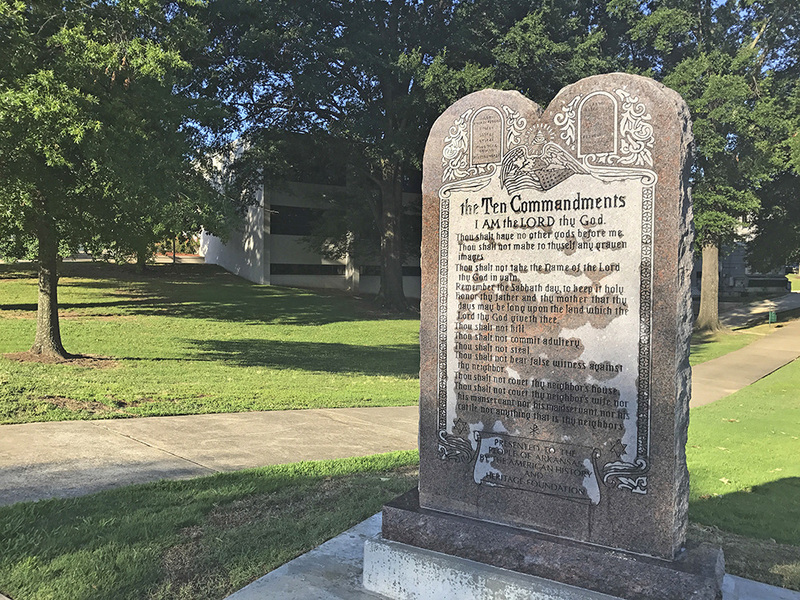 According to the Associated Press, a 2015 law required Arkansas to allow the Ten Commandments display near the capitol. But groups who argue for a strong separation of church and state have criticized the placement of a biblical statue on the grounds of the seat of the state’s government. After plans for the Ten Commandments monument were announced, the satanic temple pushed for a competing statue of Baphomet, a goat-headed, angel-winged creature accompanied by two children smiling at it, the AP reported. Other states have grappled with similar Ten Commandments controversies, including Oklahoma, which installed a 4,800-pound monument on its capitol grounds in 2012. In 2014, Reed rammed a car into that monument, Powell said. But it was replaced and stood on the capitol grounds until the state Supreme Court ruled it had to be removed, according to The Washington Post’s Abby Phillip. Reed appears to allude to the Oklahoma toppling incident in a Facebook post before the Arkansas statue was rammed. Later, he says he’s “back at it again,” and asks for people to donate money to help repair his car.